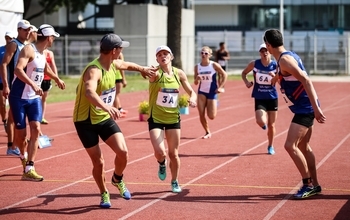 They may describe themselves as the ‘B team’ of Modern Pentathlon in Germany but Rebecca Langrehr and Fabian Liebig definitely performed their ‘A game’ as they won gold in the Mixed Relay at the UIPM 2018 Pentathlon World Championships. 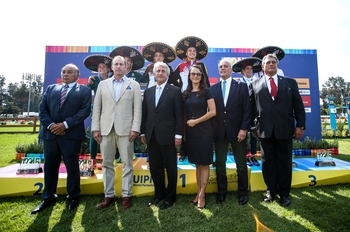 It was an unforgettable occasion in Mexico City as athletes from all competing nations gathered in the morning for an official opening ceremony that doubled as a curtain-raiser for the 1st Pierre de Coubertin #PentathlonDay. It was fitting that this celebration of the legacy of Coubertin, founder of Modern Pentathlon, should be aligned to the Mixed Relay, which UIPM is working hard to add to the Olympic Games sporting programme for Paris 2024. The Mixed Relay format is going from strength to strength, as illustrated by today’s expert participants. 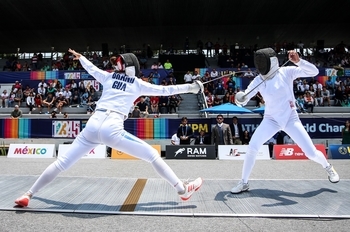 It is true that there have higher-ranked athletes in the Germany team such as Annika Schleu and Patrick Dogue, but Liebig and Langrehr (GER) blew away the competition provided by 15 rival nations on day three of the championships, building a big lead in Fencing and defending it with conviction. In fact it was the continuation of a new tradition: Germany won gold in the same event 12 months ago with another two of their less celebrated athletes, Ronja Steinborn and Alexander Nobis, demonstrating their remarkable strength in depth in the male and female ranks. Michelle Gulyas and Gergo Bruckmann of Hungary performed strongly to win a solid silver, without ever looking like catching the leaders. Alexandre Henrard doubled his medal tally for the championships after teaming up with Emma Riff to win bronze for France, holding off a stiff challenge from Kazakhstan (Elena Potapenko / Pavel Ilyashenko). 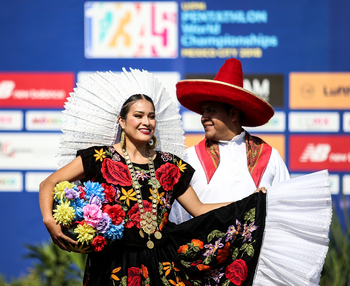 Fifth place went to Czech Republic (Eliska Pribylova / Ondrej Polivka) while China (Zhang Mingyu / Li Shuhuan) took 6th and there was delight for the home crowd as Mexico (Melissa Mireles / Sergio Flores) came back strongly to finish 8th. Liebig (GER) said: “Normally my shooting is not the best, I always struggle and make mistakes, but today I managed to cope with the pressure and it was great. After securing Hungary’s first medal of the week, Gulyas (HUN) said: “Our whole day was amazing and we were really stable in every discipline of the Pentathlon. A day after winning gold alongside Valentin Belaud in the Men’s Relay, Henrard (FRA) paid tribute to his 17-year-old partner Riff (FRA), another athlete winning her first senior medal. Henrard (FRA) said: “It was really difficult because of the altitude, and Emma was astonished by how hard it was to run in Mexico. By constructing a Pentathlon Stadium, Mexico City has become the first host city to provide the all-in-one venue that will experience its Olympic debut in Tokyo in 2020. 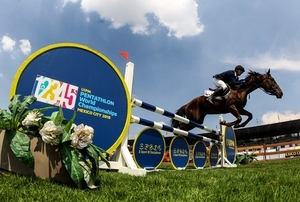 The Pentathlon Stadium enables athletes to perform all five disciplines in one venue in the space of five hours, providing a better competition experience also for spectators, media, sponsors and VIPs. Today they were all treated to a high-quality spectacle throughout. France (Riff / Henrard) got the competition off to a strong start with their time of 1:57.37, although Russia (Anna Buriak / Oleg Naumov) and Hungary (Gulyas/Bruckmann) were only a few tenths of a second slower. It was on the piste that Germany (Langrehr/Liebig) really did the most damage to their opponents’ medal ambitions, scoring a very impressive 25V/5D in the Ranking Round and adding two points in the Bonus Round. The next-best performers with epee in hand were Hungary (Gulyas/Bruckmann), who scored 21V/9D, while United States (Naomi Ross / Seamus Millett) managed 18V/12D. China (Zhang/Li) added four bonus points and Kazakhstan (Potapenko/Ilyashenko) boosted their score by three. Two teams managed a perfect score in the equestrian arena, and there was joy for the home crowd as Mexico (Mireles/Flores) went round clear along with Czech Republic (Pribylova/Polivka). Germany (Langrehr/Liebig) and France (Riff / Henrard) remained on course for the podium with solid scores of 293. The climax of the competition was, to a point, pre-determined by performances in the previous three disciplines. Germany (Langrehr/Liebig) had no problems protecting their 31sec lead over Hungary (Gulyas/Bruckmann), who in turn were comfortable with a 35sec advantage over the chasing pack. The battle for bronze was the most intense, with Kazakhstan (Potapenko/Ilyashenko) repeatedly asking questions of France (Riff/Henrard), only to find that their rivals’ rapid running more than compensated for their sometimes wayward shooting. France (Riff/Henrard) posted the fastest Laser Run time of 11:41.70, a few seconds quicker than China (Zhang/Li) and Kazakhstan (Potapenko/Ilyashenko). A special opening ceremony held to mark the 1st Pierre de Coubertin #PentathlonDay was attended by UIPM President Dr Klaus Schormann, Members of the Executive Board, officials from the local organising committee and friends of the pentathlon family. Among the VIP guests were two members of the Pierre de Coubertin Commission, Dr Lilia Victoria Sanchez and Dr Mario Eduardo Martinez, who joined Dr Schormann to present Pierre de Coubertin Medals to two of the people responsible for turning the dream of a Pentathlon Stadium into a reality this week in Mexico City. 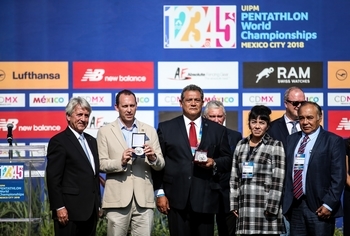 The medals were presented to Horacio de la Vega, two-time Olympic pentathlete, President of the Local Organising Committee and Sports Director for the Mexico City Mayor’s office, and Juan Manzo, President of the Mexican Modern Pentathlon Federation and Vice-President of UIPM. Guests at the ceremony watched short films demonstrating how members of the pentathlon community had played a part in promoting this special occasion on social media under the hashtag campaigns #High5, #PentathlonDay and #HappyPentathlonDay. UIPM President Dr Klaus Schormann said: “Today we celebrated, for the first time in history, the Pierre de Coubertin Pentathlon Day and we awarded Horacio de la Vega and Juan Manzo with the Pierre de Coubertin Medal. “Then we had a great Mixed Relay competition, and it was a showcase for the world not only inside our society but also for the international Olympic sport society, who can see what the Mixed Relay means to Modern Pentathlon. “The result was great in that leading countries in our movement like Germany, Hungary and France were on the podium but also that countries like Kazakhstan, China and Mexico in the top eight. We also had developing countries like Bolivia and Venezuela competing today. “This Mixed Relay, in the wonderful Pentathlon Stadium provided by our hosts here in Mexico, has given us a lot of arguments to present to the International Olympic Committee with regard to the 2024 Olympic Games. “The Programme Commission of the IOC can see what we are delivering with a really strong multi-sport and combined gender team competition. You cannot do more than what was presented today. Juan Manzo added: “Everybody is enjoying the competition, everything from the weather, the facilities, the horses, the pool, we have no complaints! “We are very proud to have the first Pentathlon Stadium here. In Modern Pentathlon we were proud to make the competition in one day, we were proud when women started to compete in the World Championships … we have a tradition of innovation in our sport. “We hope that this will be the future of Modern Pentathlon. I’ve never seen so many cameras in a Modern Pentathlon event and it’s great to have so many countries televising our sport. The UIPM 2018 Pentathlon World Championships run until September 13 and the best athletes in the world will compete on September 10 (women) and 11 (men) to qualify for the individual finals on September 12 (women) and September 13 (men). Up-to-date results will be available at the UIPM website throughout the championships and the Laser Run during the individual finals will be available to watch live on TV in many different countries (channel details here). Don’t forget to tune in to UIPM’s social media activity on Facebook, Twitter and Instagram.